Part 1 Overview: Emerging and cutting-edge technologies and academic libraries: Emerging and cutting-edge technologies: Concepts and features; Understanding academic libraries in the changing world. Part 2 Emerging technologies for academic libraries in the digital age: Where will emerging technologies lead in academic libraries? Emerging technologies for academic libraries in the digital age. Part 3 Impacts of emerging technologies: Impacts on academic library administrators and executives; Impacts on management information systems in academic libraries; Impacts on academic library information services; Impacts on academic librarians. Part 4 Outlook for the future: The eve of drastic changes; Leveraging academic library information services in the digital age. This book is written to promote academic strategic management and envision future innovations for academic library resources, services and instructions in the digital age. It provides academic executives, consultants, instructors, IT specialists, librarians, LIS students, managers, trainers and other professionals with the latest information for developing trends of emerging technologies applied to student-centred and service-oriented academic learning environments. 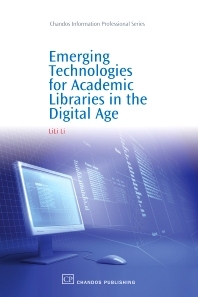 This book explores various fields where key emerging technologies may have great implications on academic library information technologies, academic library management, academic library information services, and academic library internal operations. Mr LiLi Li is Assistant Professor/E-Information Services Librarian at the Georgia Southern University, USA. Prior to that, he worked as a computer programmer and software engineer for several American business firms. Mr Li has published and lectured on library information technologies at state, national and international conferences.